A picture of Metallica on stage. Probably. 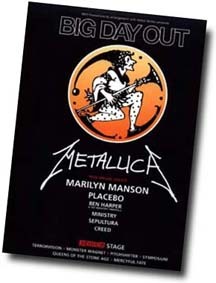 The bands alternated on the two stages: Mercyful Fate started on the Kerrang! Stage, then Creed on the main, back to the Kerrang! Stage for Queens of the Stone Age and so on. July 10, 1999. What a cracking event: a whole day of heavy metal in the great outdoors. And a decent line-up to boot. An early start meant catching the coach from Peterborough at 7am. Sadly, despite arriving at the Milton Keynes Bowl at 9am, and getting into the arena at 10, some crap licensing law meant the bars didn't open until noon. Thank goodness Wigg and I had come prepared with cans of lager, though we'd consumed half the supply on the coach down. Once the bars were open, we were horrified to discover that they were only selling Budweiser and Strongbow. A little ingenuity led to the creation of snakebites, which we happily quaffed all day, getting through a nice, round dozen pints. Eventually we discovered the fantastic potato wedge stall - veggies aren't well catered-for at metal bashes. Spicy wedges smothered with hot cheese sauce, cool salsa and garnished with lashings of sliced jalepenos. Just what was needed to divert us while Marilyn Manson arsed about on the main stage. The sun shone all day, and we got hammered. Dan discovered the sweet stall, bought a huge bag, and spent most of Metallica's set offering them to bemused metallers. Not many took him up on the offer. Unfortunately, Metallica were a little muted, thanks to the ever-dreadful, and ever-quiet, sound at the Bowl. For a purpose-built facility, you'd think they could get it right. 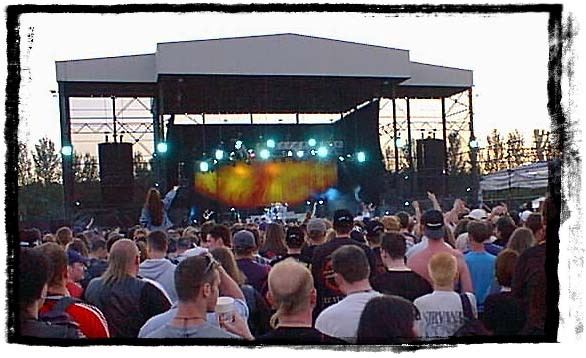 Still, it was at least better than at the Ozzfest in 1998. Dan wandered off before the end of Metallica and didn't come back. He later said that he wound up at the train station, covered in bruises, with no idea what happened. Good work, fella! (I nicked 'em off her web-site) and to Chef for the scan of the programme cover. The Kerrang! stage is to the right of the picture.